The Grossman day is all about having fun! It’s the fun of being able to try just about every sport and aquatic activity imaginable. It’s the fun of exploring art, music, drama and nature. And it’s the fun that comes from being part of a wonderful community bursting with camp spirit. Grossman is the best camp ever! I count the days until I get to come back. There’s Something for Everyone at Grossman! We strive to provide both an exciting array of activities and an encouraging atmosphere. This combination helps children feel confident trying new things, tackling new challenges and developing new skills. Our goal is for every child to leave camp with a strong sense of accomplishment. During the summer, we expose our younger campers to a wide variety of age-appropriate activities and instruction so they can discover what they like to do most. As campers mature and develop their own unique interests, they get to exercise more choice in their schedule through electives. All campers receive Red Cross-approved instructional swim and participate in free swim under the supervision of lifeguards and trained instructors. Questions about camp life? See our FAQs. Campers take full advantage of the natural waterfront with instructional and free swim, boating and fishing. Campers are placed in the class that matches their ability and have instruction for 45 minutes/day. Classes range from 3-9 campers. Campers participate in free swim for 45 minutes/day under the supervision of lifeguards and trained instructors. Something for every kid, including archery, baseball, basketball, fencing, football, kickball, soccer, softball, volleyball and more. Kids explore their creativity through music, drama, dance, photography, video production, arts & crafts, knitting, sewing and more. Kids go beyond the ordinary with rock climbing, the zip line, mountain biking, a ropes/challenge course and gymnastics. Kids look forward to camp overnights, Oneg Shabbat celebrations, exciting entertainers and our summer-long Maccabiah competition. Grossman has been committed to serving children with different abilities for more than 30 years. Our inclusive program is child-centered, tailored to the specific abilities and interests of every camper. Children with mild to moderate disabilities are fully integrated whenever possible or are part of special bunks under the supervision of highly qualified counselors. For more information, please call the Camp Grossman Special Needs Director at 617.244.5124 or email grossman-special-needs@jccgb.org. Observant campers are integrated into camp while observing Orthodox traditions and customs. They have the opportunity to daven in the morning, recite prayers at meals and observe Jewish holidays. In addition, campers are exposed to Jewish culture learning (Tarboot) throughout their time at camp. Orthodox campers are assigned to general bunks that have at least one Orthodox counselor. Our CIT program prepares campers entering 10th grade for future counselor positions. Campers entering 8th and 9th grade learn about and experience kibbutz life in this four- to eight-week program. Here’s a great way to try overnight camp! 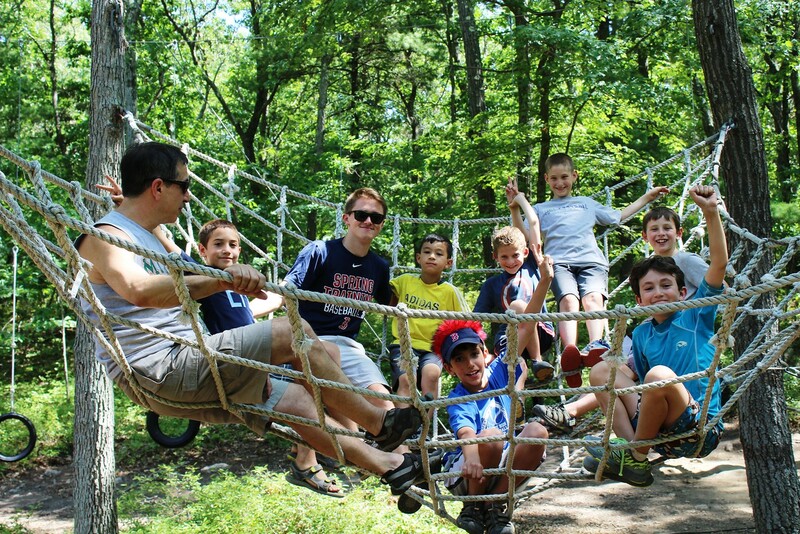 Spend part of the summer going to day camp at Grossman and part at Camp Kingswood, an overnight camp located in southern Maine. Register for at least two weeks each at Grossman and Kingswood for a combined special rate. Families that need coverage between the end of camp and beginning of school will appreciate the ninth week of Camp Grossman. Bus pickups and drop-offs are available in Newton, Stoughton, Brookline, Lexington, Sharon, Framingham, Cambridge and Natick.